A leaking washing machine can damage your flooring, ruin other appliances, and cause dangerous mildew and mold to grow in your home. It is important to fix a leak as soon as possible to prevent loss and expensive repairs. 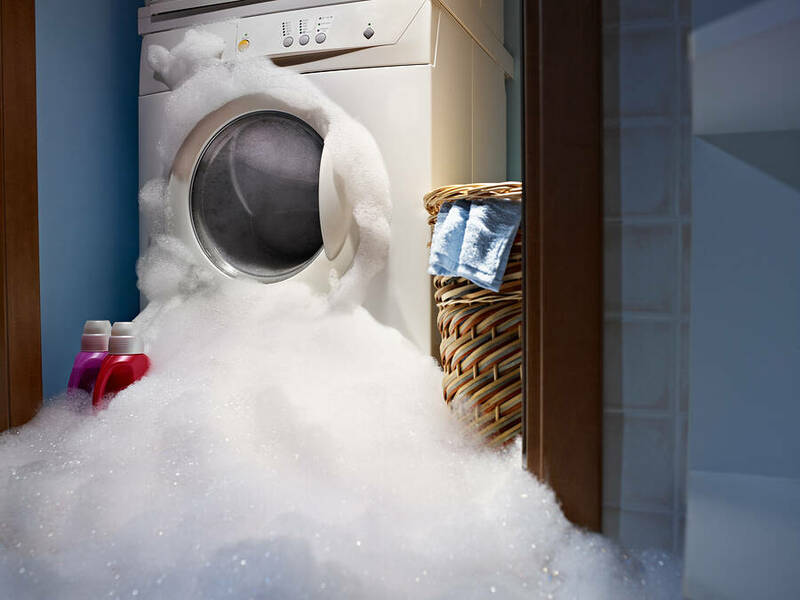 Many of the troubleshooting steps in our washing machine repair guide can help you resolve the issues quickly yourself. If you need help, It Is Fixed Appliance Repair is available seven days a week to fix your washer in your home. We offer same day* appointments in Atlanta and the Metro Atlanta area, so contact us today! Warning: To prevent the risk of injury from shock, disconnect the washing machine from the power before attempting any repairs. If you recently purchased a new washing machine, there may be a temporary drain plug placed by the manufacturer to protect the drain during shipping. Fix: Detach the drain hose from the washing machine and remove the plug. When it comes to detergent, often less is more. High-efficiency washers use specially formulated low-sudsing detergent. Using regular detergent will cause the wash tub to overflow, spilling suds and water on the floor. Using too much detergent can have the same effect, regardless of washing machine type. Read our Washing Machine Maintenance Guide to learn more. The most likely point of failure in your washing machine is the hoses. Unfortunately, there are of hoses to check. The machine will have hoses that carry hot and cold water into the washing machine tub. The tub is connected to the pump, and the pump drains water via the external drain outlet. Unless you are using high-quality stainless steel washer hoses, your washer hoses need to be replaced every three to five years. Inspect the hoses. If the hose is dripping or damp, a leak is the most likely cause. Check for kinks, blisters, holes, cracks, or signs of wear. There is no reliable way to repair a washing machine hose. If they are damaged, they will need to be replaced. Also, check the hose connections. Visible limescale or rust indicates that water has been seeping from the connection. If you can twist the clamp easily with one hand, it is too loose. If the metal connections are rusty or corroded, the hose must be replaced. The water inlet valve controls the flow of water from the hoses into the washing machine tub. The hoses connected to the hot and cold water taps connect to the inlet valve on the back of the machine. If you have already verified the hoses are securely connected, but are still see leaks from the back of the machine as it fills, the inlet valve may be defective. To fix the leak, replace the inlet valve. Your washing machine drains from an outlet on the back into a dedicated drainpipe. If the drain pipe is damaged, clogged, or not properly connected, water will pour from the back of your washing machine when it drains. Inspect the drain hose for cracks or signs of wear. If the drain hose is damaged at all, it will need to be replaced. Over time, the drain hose or pipe can become clogged with soap scum, limescale, lint, dirt, or other debris. To check for clogs, run a plumber’s snake or unbent wire hanger through the drain hose to ensure there is nothing preventing the flow of water. Seat the drain hose firmly into the drain pipe. If water still leaks from the pipe, contact a plumber to locate the source of the clog in your home’s internal plumbing. Front-loading washing machines have an emergency drain hose separate from the standard hoses that push water in and out of the machine. The emergency drain hose allows the user to manually drain water from the machine if needed. The drain hose is located behind a panel on the front of the machine. Remove the panel following the instructions in your user’s manual. Inspect the hose for cracks or damage. Also, verify that the plug is inserted firmly into the end of the hose. If the plug is loose, water will drip from the hose any time the washer is in use. If the emergency drain hose is damaged, it will need to be replaced. The pump is the device that pulls the water out of the washer tub and pushes it to the drain. An easy way to determine if the pump is the source of the leak is to place a dry newspaper under the washing machine and run a cycle. At this point, you should have already checked your hoses, so if water is dripping from the back, the pump is the most likely cause. You will need tools to inspect the drain pump. For most washers, all you will need is a Phillips head screwdriver, but more may be needed depending on your model. Following the instructions in your owner’s manual, remove the shell covering your washing machine and inspect the pump. Remove the filter screen over the pump inlet. Inspect the pump inlet for debris or foreign objects. It’s not unusual for a small sock or another article of clothing to get sucked into the pump. Wash the filter screen with hot soapy water before replacing it. If you did not find any obstructions, the issue might be with the pump seals. Watertight rubber seals inside the pump keep water from draining out while the pump is in use. Rubber seals degrade and crack over time, allowing water to leak out. If the pump is dripping or has collected condensation, it has a leak. There is no way to repair a drain pump; it will need to be replaced. If you need replacement parts, It Is Fixed Appliance Repair carries factory-original parts for most major brands. Contact us today for assistance. Front-loading washing machines have a locking mechanism that keeps the door closed during the wash cycle. If the catch is faulty, the door will not form a tight seal and water will leak from the machine. Repeatedly opening and closing or slamming the washer door can cause the door catch mechanism to wear out prematurely. Inspect the catch for signs of wear. If you can pull the door open enough for water to escape during a wash cycle, the door catch will need to be replaced. If you see water seeping from the door of your front-loading washing machine, you may have a crack in your door seal (bellows). The bellows are a folded rubber seal that keeps water in your machine when it is running. Over time the seal may be damaged or simply crack and wear out. Open the washing machine door to inspect the bellows. If the seal is dirty, simply washing the bellows with warm soapy water may fix the problem. If the bellows are torn or worn, the seal will need to be replaced. On many models, it is necessary to remove the front panel and door assembly to replace the bellows. If you need assistance with replacement, It Is Fixed Appliance Repair is happy to help. Contact us seven days a week for a same day appointment. Place a dry newspaper page under the washing machine and run a cycle. Knowing where the leaks originate and at what part of the cycle they occur can help you determine the problem. If you have a top-loading washer that leaks from the center when it is spinning or agitating, you may have a faulty center post gasket spin tube seal. If a center leak occurs after the fill cycle starts (but not while the machine is filling) you may have a rusted tub seal or hole in the tub. Leaks from the side may indicate a faulty air dome deal. To verify that the seals are the root of your problem, remove your washing machine’s shell following the directions in your owner’s manual. If you have a top-loading washing machine, you will need access to the front of the machine. If you have a front-loading washing machine, you will need access to the back. While the machine is operating, look for signs of leaks around the transmission shaft, rear bearing housing, or tub. If you see a leak, a faulty seal is the most likely cause. Repairing the leaky seals requires disassembling the washing machine. We recommend hiring a professional washing machine repair service like It Is Fixed for this type of repair. If you need a same day* appointment, you can contact us seven days a week. Our technicians are available in Atlanta and the Metro Atlanta area. The water level switch is a pressure-activated switch that controls the level of water in the washer. If your washer leaks at the end of the fill cycle it may be overfilling. If you have a top-loading washer, open the lid and watch the water level during the fill cycle. If the water exceeds the max-fill line, the problem is likely the water level switch. For a front-loading washer, run a cycle without clothes. Observe the water level through the door. If the water reaches the top of the washer tub and starts leaking out of the bottom of the machine, the washer is getting too full. If your washer leaks at the end of a fill cycle, the washer may be getting too full. Washing machines have a pressure-activated switch that controls the level of water in the washer tub. If the water level switch is defective, it will need to be replaced. It Is Fixed Appliance Repair is available for same day* appointments seven days a week. We have technicians trained in washing machine repair in Atlanta and the Metro Atlanta area. Contact us today for an appointment or book online.